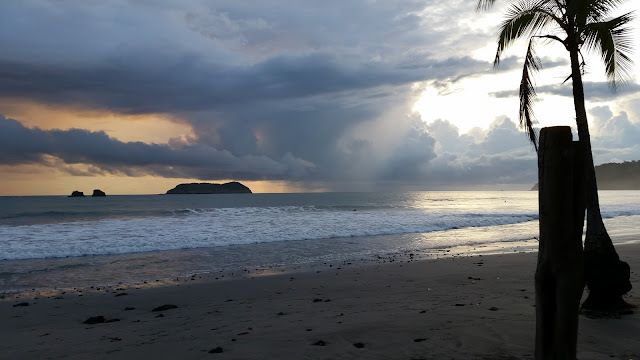 Please note that this is the third Blog about my travel in Costa Rica last year. If you are interested in the other parts as well, please feel free to read them as well. After the last night out in town we had a slow start into our last day in La Fortuna, as we werent leaving until the Afternoon. So we had the chance to sleep a bit longer and have some time for ourselves. As I am not a late riser I got up early again and used the time for walking around town a bit and looking for some Gifts and some postcards. My vacation was already half over and I didnt wrote one postcard yet. I knew if I wouldnt change that my friends back home would kill me. So I thought it better to take no risk and buy some postcards. After I have found everything I needed I looked for a nice place for Breakfast and found a decent looking Restaurant and had a wonderful breakfast that included, Eggs, Bacon, Sausages, Orange Juice and of course Beans and Rice. The remainder of the Morning I spent with writing my post cards back in the Hotel and talking to my fellow travellers and we used the modern media to exchange some of the photos we took on the trip so far. Wifi is such a great invention as it helps you to exchange media files like Photos so easily and quick. After a last lunch in La Fortuna at our favourite Soda Place it was time to say goodbye and we left the town by bus. But only till we reached the huge artificial lake just outside of town. Our destination that day was the wonderful located Monteverde, and to get there we had to cross the lake before we would take another bus on the other side of the lake who would bring us to that small village located right up in the Hills we were able to see from the lake. Crossing the lake didnt take very long, maybe about 30 Minutes, but it was a nice trip as we had some wonderful views on the nearby located El Arenal and across the lake towards the hills on the other side. Back on the other side we grabbed our stuff and put it in the bus that was already waiting for us and were on our way again. Monteverde was not really far from the lake, but as it was located high up in the hills and the roads were very windy and not in the best conditions it took some time to get there. On the way we stopped at a small Roadhouse/Pub/bar where in an embedded Garage was a Sunday Afternoon Karaoke Party in full swing. I have never heard so many people singing in the wrong tune at the same time. But the atmosphere was amazing. Everyone seemed to be happy and in a great mood. It really looked like fun. Not long after we finally arrived in Monteverde, to our next destination and home for the next few days. Monteverde is a really small village in the middle of nowhere. In the 1950s a group of Quakers from the United States made their way here to find a new home, far away from the religious oppression they have felt in the USA. Over the next decades they built up the town and its surroundings. But it was not until the 1980s that Monteverde got more famous. It was after an Article in the National Geographic which described this small village as the perfect place to observe the Quetzal, the most famous and beautiful bird in central America. And after that more and more tourists came to visit this small village. And over the years a totally new touristy infrastructure was build. So nowadays you can choose between several Hotels, B&B and Hostels and several Restaurants and Bars. And also the list of activities got bigger with the years. From Hikes in the Nature over Birdwatching to Zip Lining and Bungee Jumping, you can do everything here. The thing that makes Monteverde a bit different is, that the people in the village are not really that happy about the Masses of tourists that are coming to town these days. I am sure they value the extra Money they are getting. But still they are trying their best to protect the Nature around the village. So up to day it was refused to rebuild the roads that are leading to Monteverde. The only road you have is a small dirt track winding through the mountains. With the hope that this will keep at least some people away. And I think they are having good reasons to protect the Nature there. As Monteverde will be one of the most beautiful places you can visit in Costa Rica. The Village is surrounded by Forests on every side which gives you the impression that you are in the middle of the wild. Most of the Forests around the Village is Cloud/Fog Forest. A type of Forest that is characterized by a covering of very low lying clouds. Which gives you the impression that you are walking through a very thick fog or clouds. Looked up from above it looks amazing. 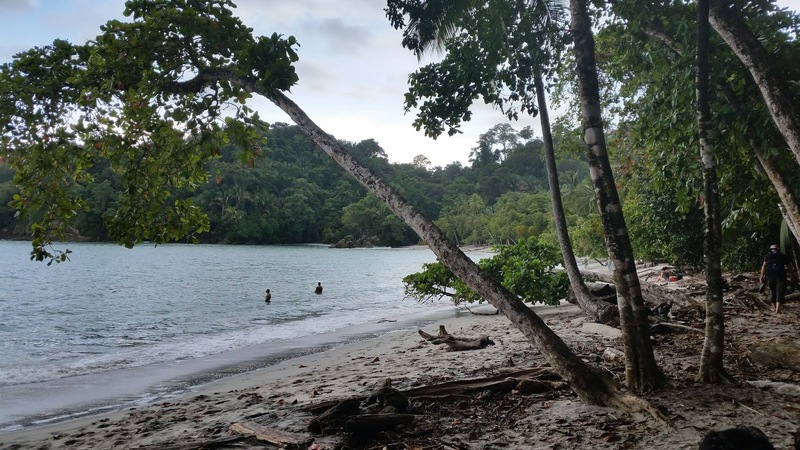 There are several National and private owned Parks and Sanctuaries, so that the whole area around Monteverde is building a huge protected area for plants and animals. And the wildlife in these forests is amazing as we were about to learn in the next few days. You can find a huge amount of different birds, mammals, reptiles and insects here. But on that first night it was already too late for that. We just dropped our bags in the Hotel, where I as a single traveller got the biggest room of the Hotel somehow. We took an cab into town that night as it was raining really hard and went to a nice Italian Restaurant where we had a nice dinner and talked about the activities options we would have on the next days. The majority of the group wanted to do the Zip-Lining. Where you get secured by an harness and then can swing on a rope with high speed over some valleys far below you. Not exactly my idea of fun as I am not that fond of heights and neither of speed. But luckily there were other options as well. I definitely wanted to see some of the amazing nature in this wonderful place. After the dinner me and a friend from our group decided to walk back to our Hotel, to get some fresh air and to get some exercise after the big amount of Pasta we just had. The way was very steep most of the time and it was sort of an exercise. But funnily we managed to get there at the same moment the rest of our group arrived there in a taxi. Somehow no one wanted to believe us that we really walked. The next morning we started early with an hearty breakfast at the Hotel. With Toast, Eggs, Bacon and of course Rice and Beans. And then the bus was already waiting outside to take us up to one of the National Parks in the Region. The Monteverde Reserve, which lays right at the end of Monteverde on the side of town our Hotel was located. So we only had to follow up the road. On the way there we got some fantastic glimpses on the wooded valleys below us. At this time surprisingly without any fog or clouds. A fantastic view. In the Reserve we did a wonderful two hour hike with our Guide, who had been here already a couple of times and knew his way around. He wanted to show us an Quetzal that day but unfortunately it was just not the season for this bird. But we did saw some other birds and animals on the way. Some wonderful Butterflies, a poisonous green snake, some monkeys and also some hummingbirds. And it is so amazing to see them for very close. There were some feeding stations for them, filled with some sort of sugared water, and they were flying around this stations ins swarms. We could have stayed there for hours as it was so amazing to see them fly around in all their different sizes and colours. Such beautiful birds. Not just the wildlife also the nature was really impressing here. Dense Forests with huge trees, waterfalls and some amazing views on the hills and valleys around you. It was really nice to walk around there. As the weather was really nice and not too hot that day some people in our group decided to walk back to our Hotel instead of taking the bus. And it also was a really pleasant hike alongside the road from which we had a really nice view across the hills and valleys. As I still had enough energy that day I decided to do a hike of my own after we were back in the Hotel and it was not even Noon yet. So I set out again to climb atop one of the Mountains in the area. The Cerro Amigos which rises about 1842 Metres and from which you are supposed to have some really nice views of the area around you. What I didnt expected was the steepness of the path up the mountain. I am usually used to walking up steeper hills and Mountains. But here at this Mountain in Monteverde I was really struggling, as every time I managed to climb one steep path and was on a more even part again, of course when I went around the next bend it was going uphill again. And add to that the whole ground was wet an slippery from rain and had a lot of rubble lying around. So it was really exhausting to make some progress here. But eventually I made it to the top after some time. But unfortunately in the mean time the weather changed and all the area disappeared in clouds. So I had no good views from the top. But from the distance you can see up from the summit, I am sure the views must be amazing on a clear day. So it is definitely worth the effort. As it now also started to rain and the ground got even wetter the way downhill was even more exhausting as you really had to take a good look where you were stepping. But eventually I made it down again without tumbling down the hill. Back at the Hotel the activities of the day were not over. As we sat out for an Night walk in the Jungle that evening to spot some wildlife.
. Once it started to get dark we were picked up by a van and brought to a part of the Cloudforest on the other side of the town. And after every own got equipped with an torch we set out towards the Woods with our guide. But we only went out the door before we saw our first animal that night. A sloth was sitting in the tree right in front of the House we just came out. And with the help of the very strong torch of our guide we had a very good view of it from very close by. And after the sloth had enough of the unwanted attention and disappeared into the higher branches of the tree we finally sat out into the wood. And what an amazing experience it was to walk around the jungle in the middle of the night. Hearing all those nocturnal sounds from the insects and animals around you. And we also managed to spot some animals here and there. Of course a lot of weird looking insects you surely dont want to find inside of your house. We managed to see some birds who were already sittting asleep on some branches and surely were not amused about this disturbance .We also saw some racoon like mammals and also a huge tarantula. It was an very amazing and exciting hike that night. And everyone in our group agreed that it was one of their highlights on the whole tour. On the next morning I got up early again as I still had some plans for our last day here in Monteverde. I wanted to visit another strip of Rainforest in that area. The Bosque Eterno de los Ninos. This 220 square kilometre big area was bought with money that was collected by school kids from all over the world. And it is really amazing to see what you could do with such donation. Instead of building a big touristy infrastructure here, it was decided that it was more important to make this part of land an possibility of retreat for the animals living here. So there are only a few hiking trails that are leading mostly along the edges of this Rainforest, but it is nearly impossible to get into the centre of it. Which is a really good idea I think. And the existing hiking trails are more then nice to walk along. Tony from our group accompanied me that morning and we really had a nice walk in the Forest, but we werent lucky with our animal spotting. We just saw a few birds, but otherwise the forest looked deserted. But still it was a really enjoyable hike we had. Then I had some hours of rest before in the afternoon I went with another friend out of our group to a coffee plantation tour. If there is something Costa Rica is famous for beside the amazing nature it is coffee. And why not take the chance and see how such a plantation is working. Unfortunately we were really unlucky with the weather and from the moment we arrived there it started pouring down. But still the tour was still fun and really interesting. We were first thought where the plants are growing and how the harvest of the fruits is done and afterwards we were shown how the fruits are worked into the well known coffee beans. An really interesting process. And the smell of fresh roasted beans is just irresistible even to a non coffee drinker like me. Later we were also shown how cocoa beans are made into cocoa and chocolate. For me an even more interesting process. And of course we got our taste of it afterwards. It was funny to see how bitter cocoa taste if you havent added milk or sugar, You wouldnt recognize it. After we had a short break with Coffee and Cocoa afterwards and the rain finally stopped we went back to our Hotel where we were greeted by our Guide who asked how we liked the tour. And we said we liked it very much except the rain. And he asked which rain as it was dry all the time here. The answer to that is, that the the coffee plantation was built on the ridges that is diverting the Caribbean part of Costa Rica from the Pacific Side of it. And as the Hotel was on the one side and we were on the other side, the rain didnt made it over the hills and stayed on our side. Even though we were only a few Kilometres apart. After a last night out with Dinner and some drinks we went to sleep as on the next morning we would leave this green Paradise to travel right to the next Paradise. This time we would be leaving the Highlands for the Pacific coast. And I think everyone was looking forward to seeing some beaches and the Ocean again. So we set out the next morning with the most beautiful weather, which allowed us some amazing last views on the area and then we were on our way towards the Pacific. The first part was on dirt tracks, and we got another free Costa Rican massage. But then at one point we reached the Highway and from there on it was a really smooth ride. We had one nice stop on the way. Right at a bridge over a bigger river. And there was a good reason to stop there in the middle of nowhere. As this was a spot very popular for Crocodiles. And we were not disappointed. We spotted a bigger group lying down at the river side in the sun. And how big and impressing they were. My Camera was even more impressed then me and stopped working. Somehow some moisture got onto the lens because of the big Humidity we were having outside and I was unable to get it clear again that moment. It took about an hour until it was okay again. At least I was able to get a few shots of the crocodiles. Then after we had some amazing fresh smoothies made at a small booth not too far from the Crocodile Bridge we were on our way to Quepos. A small but very vibrant town directly at the Pacific coast. 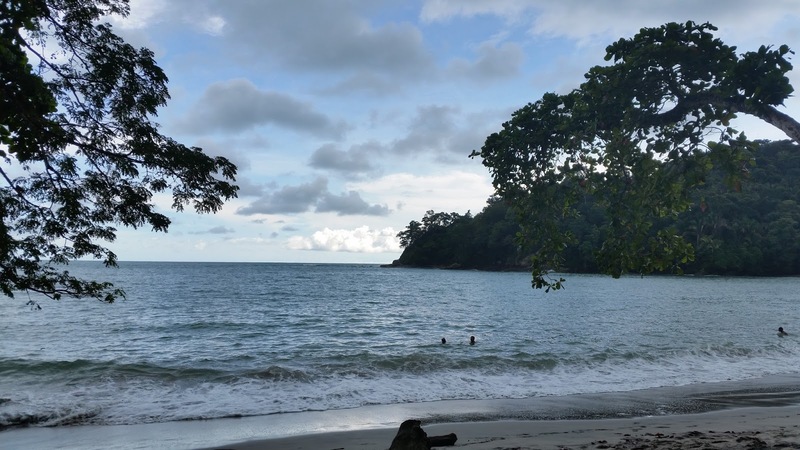 From the moment you enter you can see tha the town makes it living out of the Tourists who come to this town to visit the very close National Park Manuel Antonio. 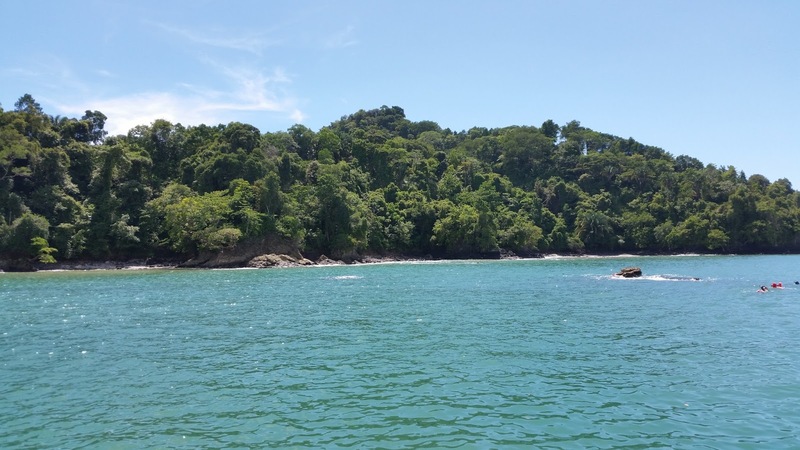 The smallest National Park in Costa Rica, but it is also one of the most beautiful ones. So the first things you see when you enter the city are Hotels, Bars, Restaurants and Souvenir shops. A lot of opportunities to spend your money. Besides this shopping area, the town got a nice promenade lined with trees alongside the water. A good place to spot Birds in the Morning Hours. One of our group saw some big Red Macaws there one morning. On that first day we didnt spend much time in Quepos, we just stopped at our Hotel which Highlight was a nice outside pool in its centre, dropped our bags and went straight outside again to take one of the public buses that are leaving every few Minutes towards the National Park. After we left the town centre behind us the bus was driving alongside a winding road uphill from where you had a glimpse on the ocean from time to time. Otherwise some Huge Hotels or Restaurants were blocking the view. From the Bus stop it was just a few minutes walk to the entrance of the National Park. And from there on you once again had the feeling you were entering a different world again. The busy streets with shops and Hotels were replaced by a massive Rainforest on both sides of the trail leading through it. An again an abundance of Wildlife. A lot of guides equipped with some telescopes where showing their groups the animals they have spotted. We always tried to spot the animals when we passed them by. Sometimes it was a bird, some insects or some lizards. There surely was a lot to discover here. But alone the Forest was already very impressive. It was very dense at some spots and it was nearly impossible to look through it. Our guide told us to look out for some Squirrel Monkeys that you usually see very often in the Park. But not on the day we were there. But still it was so amazing. After we have walked for a while we came down to a beach which looked like out of the catalogue from a travel agency. White sand, lined by jungle and with a very inviting looking ocean. I first had thought I would use the time we had in the park to walk around a bit more. But after I have seen this place I spontaneously decided to stay here. And so did some others in our group. Our Guide walked on with the rest of our group, told us how we would find our way back and that we would be careful of the raccoons that were roaming around here. They have no fear of Humans at all and are very cheeky and try to steal everything they can. And no joke, I saw one of them opening a trash can with a big metallic lid on it by its own. And a bit later one Raccoon stole a bag with food out of the backpack from one member of our group. But beside this it was very peaceful and calm there. And I think I had one of the best swims in the ocean of my life. The water was really warm and inviting. And it was so relaxing to swim around and have a look on this paradise around you. I could have stayed there for days without problems. Such an amazing place. But unfortunately at one point we had to get up again as the park was about to close, and so we made our way back towards the street with the bus station where we decided to meet up in a close bar. And one by one everyone got back from the Park. Some of them spotted some Monkeys on the street around the corner, and so we all left the bar again to have a look. And right, there was a whole bunch of Squirrel Monkeys right before our eyes on the trees above you. And so it was fun to watch them for a while. Before we made our way back to the bar, where we enjoyed a cold beer and watched an amazing sunset over the ocean, before we made our way back to the Hotel and went out for a nice dinner in a Restaurant close by. For the next day we had something very special planned as it was our last real day of the tour. Unbelievable how fast the time was passing by. And we wanted to end this fantastic tour with something very special and worthy. And so we set out on a Catamaran tour on the Pacific that morning. The plan was to drive out with the boat and hoping that we would be able to spot some Dolphins. We set out around 10 in the morning with the best weather you could wish for. The sun was shining and it was really warm. Thankfully we had some shade on the boat otherwise it would have been to hot. 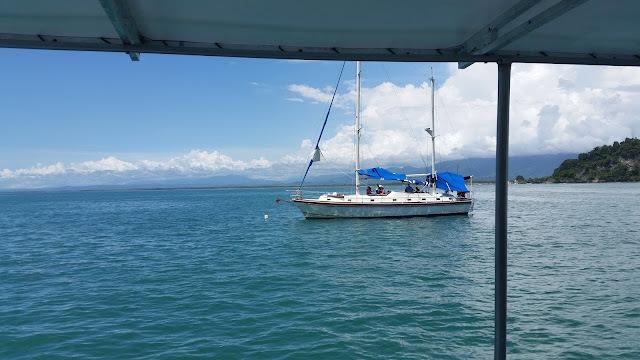 Unfortunately we didn't manage to spot any Dolphins on that tour as they were not to be seen that day, but nevertheless it was a very enjoyable ride. We stopped for lunch in a very beautiful bay where we also had the chance to get into the water for some swimming and snorkelling. And again it was really wonderful to be in the warm water. So we had some real Holiday feelings on our last day again. But unfortunately all good things have come to an end and the boat dropped us off at the harbour again and we got a free ride to the beach we watched the sunset the evening before. There we had the chance to swim a bit more and enjoy the Sunshine. When it got to hot in the sun we drove back to the Hotel and went inside the pool there. In the evening we went out again for a last Dinner together as two of us would leave the group the next morning to go on another tour. . And I think the emotions were really mixed that night. Everyone was happy that we had such a wonderful time on this tour, and I am sure a lot of us had to think about all the things we have seen and done in the last two weeks. And of course there was also some sadness as the tour was now about to end. But it was a really enjoyable and nice evening with a lot of smiles and laughter. On the next Morning we had some few hours for ourselves before we would take the bus back to San Jose. Everyone used the time for buying some souvenirs, strolling around the Promenade and sitting around the Hotel and having some rest after the eventful last days. And then in the Afternoon we were back on our way to San Jose. It was nice to see the beautiful scenery of Costa Rica passing me by for the last time and I remembered all the amazing things I have seen in the last few weeks. 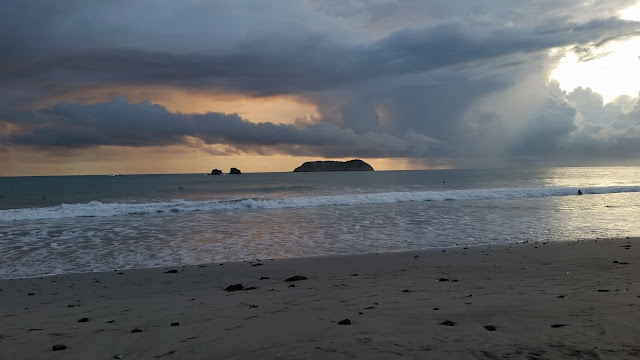 Costa Rica is surely an amazing and fantastic place. It surely is one of the most beautiful places in the world. Rarely have I seen a place so filled with so many beautiful landscapes and such an abundance of Wildlife. I was more then happy that I had made the decision to visit this wonderful place. And I really hope that I will have the chance to come again in the future. We arrived some hours later in San Jose just to find out that the street where the Bus station used to be was literally washed away. There were a lot of heavy rainfalls in the days before and the earth beneath the street was totally washed away, so where the street used to be was now a huge hole. Something you surely dont see every day. Thankfully the street with our Hotel was still existing so we didnt had to camp outside that night. We just dropped our bags in the room and met up again for a final dinner that night. Our Guide know a really good restaurant around the corner and we managed to get a table for all of us there on that busy night. And had a really good dinner there where we had a last chance to remember all the amazing things we have experienced on that trip. Before it was time to say farewell that night. As some were leaving really early the next morning, and others like me would have some extra time left in San Jose. And it is always sad to say goodbye after such an amazing time. And I surely had the feeling that I have made some friends here. And you could tell that everyone was feeling like this now. On the next morning I met up the remainder of our group at breakfast and as all three of us had some time left we decided to visit the Zoo that morning which was not too far from our Hotel. But I have to say that the Zoo made a sad impression on me. It looked really uninviting, the cages for the animals, especially for the birds were way too small, so it left a rather sad aftertaste. Of course it was fascinating to see some Toucans and a Jaguar from very close up. But I rather see the animals in the wildlife. As we still had some time till checkout we decided to visit the Gold Museum in the centre. It is part of the National Bank and it also looks like a big Vault. Maybe no wonder when you think about the riches they are having in there. It was nice to get a view on the History of Costa Rica there, as the History is really close connected to the History of Gold. It surely is worth a visit. After that I said farewell to the last two of our groups and went back to the Hotel to pick up my Baggage and to go to my new Hotel for the last two nights in San Jose. In the evening I met up with my Penpal from San Jose again and had a wonderful evening chatting in a bar from where we had a nice view on the streets around us. And as it was Halloween that night, it was funny to watch all the dressed up people from above. 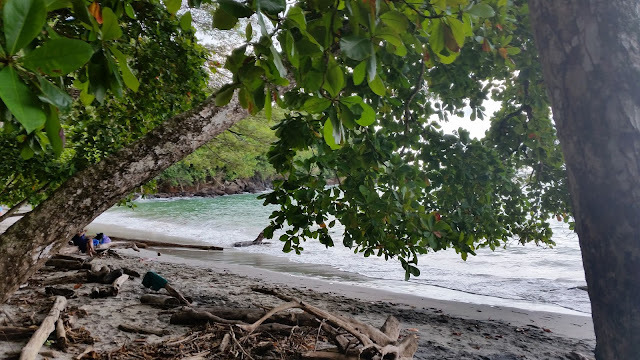 My last day in Costa Rica was then spend more or less quiet, I went into town to buy some souvenirs and otherwise divided my time with swimming in the pool or reading. A relaxing end of this amazing journey.